We’ve been eagerly following the rise of Satanic TV, thanks to new shows like Lucifer and Damien. But it turns out there’s room for another sinister trend: cults! A just-announced, Jake Gyllenhaal-backed drama for A&E joins upcoming Hulu series The Path in delving into this scary subject. The Gyllenhaal project is as-yet untitled, but it will be an anthology series and its first season will draw inspiration from a real-life case: Peoples Temple leader Jim Jones, the magnetic preacher who led his followers from San Francisco to Guyana. In jungle-isolated “Jonestown,” nearly 1,000 people died in a 1978 mass murder-suicide, including elderly church members, children, and a U.S. Congressman who was investigating the commune on behalf of constituents who were concerned about family members who might be trapped in the cult. Further details, including casting (suggestion: Gene Jones, who was so eerie as a Jones-like figure in Ti West’s The Sacrament) are TBD; the timing of the series announcement suggests it’s building off the current cultural obsession with true crime, in the wake of Making of a Murderer and its ilk, in addition to being part of the emerging cult craze. As for the latter, The Path—which stars Hannibal’s Hugh Dancy and Breaking Bad’s Aaron Paul, and is about a fictional cult led by Dancy’s character— premieres March 30 on Hulu. 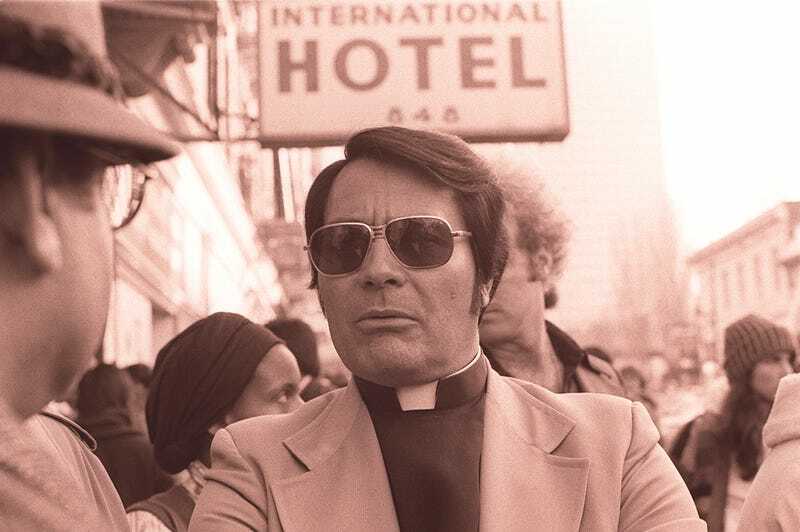 Top photo: “Jim Jones in front of the International Hotel” by Nancy Wong. Own work. Licensed under CC BY-SA 3.0 via Commons.